Hot sauce of the week! 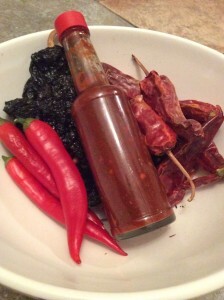 We shared a new red pepper hot sauce last week and decided to feature a new one every week! We will start out with an easy one. It’s not spicy, link just smokey and delicious. Perfect for that person who can’t handle the heat but wants a great sauce for their tacos or eggs in the morning. Or if you just want to easy into the heat. Soak dried peppers in a bowl of hot water for 30 minutes. Make sure peppers are completely submerged. Or you can use a ziplock bag. Just make sure it is on a flat surface and you flip it half way through . Once peppers have soaked pull off stems and discard them. Some seeds and veins will come with the stems and that's fine. Not all your peppers will be completely soft, approved that is ok.
Take the chili's, more about garlic, vinegar and blend, adding salt and pepper to taste. Take sauce and put in your favorite jar or container. * if your anything like us chances are you don't like to waste things. As we kept making hot sauces, one thing was bothering us. What to do with the left over solids? We think we are coming up with some great ideas. And if you stay tuned we will share our discoveries.